Highway Large Debris Removal Machine Introduced by Gator Industries, Inc.
Company president says machine will remove items like tires and animal carcasses at highway speeds. In his 33 years of manufacturing, Walt 'Gator' Hopkins has fabricated a wide variety of items. His company has several divisions, including manufacturing tanks, bins, vats and custom material handling equipment. Proprietary development of items to address particular issues, especially safety, has been one of Hopkins primary drivers. In this case, he set out to provide a more safe method for removing large items of debris from highways. The large debris pickup machine Hopkins has invented is named the 'Gator Getter' not because that's the nickname he's been known as for years (hence his company name). Rather, the name is from CB slang where a discarded and hazardous chunk of tire tread along the roadway is called a 'gator' by truckers. According to Hopkins, his Gator Getter product will pick up a wide variety of large items from a highway, and do so at what amounts to normal highway speed. Plus, because the items are being picked up by someone operating a vehicle, with no need to slow down significantly or get out of there vehicle, there are enormous positive safety implications. More and more jurisdictions are struggling to meet the EPA's storm water requirements for pollution runoff. And, studies have shown that air sweepers in general do a better job of picking up the small micron debris where pollution tends to attach. Historically, however, the problem with using air sweepers in highway sweeping applications has been their inability to pick up and remove anything larger than what will fit through their relatively small intake tube; about 10" in diameter. If it operates as advertised, operating the patented Gator Getter in advance of doing highway sweeping may well allow the use of air sweepers in some applications where a mechanical broom sweeper has historically been required. Although there would be an additional expense in operating both a sweeper and a Gator Getter, this may be more than offset by several factors. For one, and air sweeper is typically less costly to operate than a mechanical broom machine, at least in terms of consumables. Secondly, because it is much more expensive to remove storm water pollution once it has reached the 'end of the pipe,' as compared to picking it up with the sweeper beforehand, there may well be a significant overall lowering of cost to a jurisdiction faced with pollutant removal and a meeting of its storm water permit. 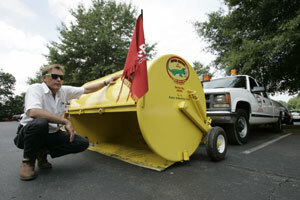 The Gator Getter is designed to fit onto the front of existing vehicles in a DOT or contractor fleet. It is relatively light as well as inexpensive, when compared to a traditional sweeper. The width is basically full-width across the vehicle, like a snowplow blade. It also is operational at night with an optional lighting package. To operate the Gator Getter, a minimum of a 1-ton truck is needed, preferably a cab-forward design that allows better longitudinal visibility. To simulate one of the biggest problems for pickup on video, that of picking up dead deer, the company used a dead dairy calf. "We picked it up with no separation of limbs, fur, skin, etc., even though we do it a 50-60-70 mph," said Hopkins. "We actually do need to pick up at speed, not at a low speed. We have proprietary 'check and balances' on the machine so whatever is picked up is retained on the machine. "To offload you pull a pin on the apparatus and the 'reception' or 'holding' tray drops down and the items are deposited on the ground. This is the side of the road, an adjacent rest area or wherever you want to offload it. For some items, that might be the back of the pickup truck. Once the debris has been removed – and of course you need to follow all your state's requirements – then you follow the guidelines for that item." "I guarantee users can be 10-to-1 more efficient in picking up all kinds of road debris," says Hopkins, "and not have to use any attenuators or put employees at risk during the process. You will be running with traffic at full speed in the lane of traffic." As a part of this article coverage we offer an audio interview with Walt 'Gator' Hopkins conducted in July 2011 with the Editor of WorldSweeper.com, Ranger Kidwell-Ross. In the 29-minute interview, Hopkins discusses the background for the Gator Getter, as well as the variety of ways it may be used. Note: To listen to the interview with Hopkins, click this link or on the small triangle inside the circle you see to the left. If you have any trouble accessing this audio, please let us know. 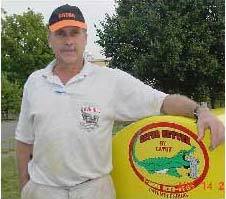 We have additionally linked a YouTube video below showing the Gator Getter in action. The video is narrated by Bill Billings, Maintenance Supervisor for Missouri DOT. You will want to see what he has to say in the video about MDOT's use of the Gator Getter. Finally, we invite you to listen to a 20-minute, personal audio interview with Billings conducted by Ranger Kidwell-Ross. It provides the listener with a first-hand example of how the Gator Getter 'changes the equation' when it comes to removal of large highway debris. Note: To listen to the interview with Billings, click this link or on the small triangle inside the circle you see to the left. If you have any trouble accessing this audio, please let us know.